No restaurant as such, but meals and snacks can be provided. close to royal palaces, and just three minutes walk from the famous Jemaa el Fna Square. We are frequently told that it is our passion for the city, its people, their culture, and the property that allows our guests to love their stay. We try to treat all our guests as friends, share our knowledge, and do our upmost to ensure that guests have the best experience possible. For this reason one of the owners is always resident in the Riad to offer advice and support. However, there are a number of other essentials; location, style and value. The Riad is located in Mouassine (often regarded as the best area in the Medina). The Riad has been faithfully restored in a Moroccan style and we are priced competitively with other Riads in our location. 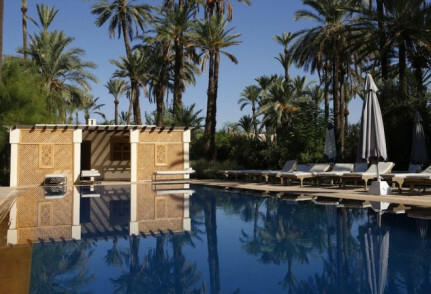 Everything that Marrakech has to offer is a short walk away. Our central medina location gives access to the whole medina, a UNESCO heritage site, with its excellent restaurants, museums, royal palaces and souks. Also, our close proximity to the Medina gate of Kssour gives easy access to the new city of Guéliz where the Majorelle gardens are located, modern restaurants, and the train and bus stations. We have received very positive feedback about breakfast. They are centred on the provisions of our local bakery that has beautiful pastries and great bread. We also have home made jam, fruit juice and offer a hot course. We also try to give our guests the experience of a traditional Berber breakfast. This is a tagine of eggs, tomatoes, peppers and Moroccan spices and is very popular with our guests. For guests wishing to experience some traditional Moroccan home cooking we can prepare an evening meal with some advance notice. All ingredients are freshly sourced on the day and are prepared by our excellent Moroccan cook. We can make excellent restaurant recommendations, in a range of price brackets, that are based on our personal experiences. 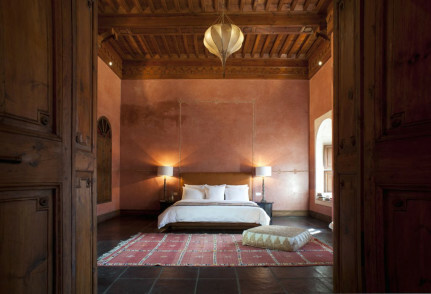 The rooms on our first floor are the most popular as they are more spacious but guests also hire the whole Riad giving a party of up to ten exclusive use of the Riad.